Katharine Hepburn, John Wayne, Lauren Bacall—behind each of these stars was a hidden force: the talent agent. 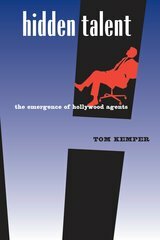 In this first-ever history of Hollywood agents, Tom Kemper mines agency archives to present an insider's view on their tooth-and-claw rise to power during the studio era. It's a tale of ambitious characters, savvy calculation, muckraking, financial ruin, and ultimate triumph, and establishes the agent's vital role in the Hollywood business world. Existing studies characterize agents as a product of the 1950s, but Kemper revises the record to show how agents emerged from the primordial film industry during the late 1920s and carved themselves a permanent niche. Through case studies of key figures like Myron Selznick and Charles Feldman, we see that the agent's character and social relationships functioned within a business structure—a good reputation and powerful connections were his most precious assets. With wit and precision, Kemper locates Hollywood agents at the crossroads of talent and profit, and captures their central and enduring role in the burgeoning film industry. Tom Kemper is Visiting Lecturer at the University of Southern California, and a teacher at the Crossroads School of Arts and Sciences in Los Angeles.